CNN’s and TIME’s Fareed Zakaria travels to and across India for an extraordinarily insightful look at the world’s largest democracy from the inside – its complexities, challenges, and achievements. 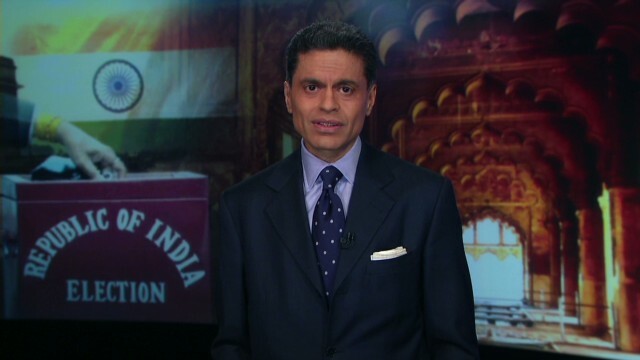 The one-hour in-depth special report, India at a Crossroads – A Fareed Zakaria GPS Special will debut Sunday, Dec. 29 at 10:00am and 1:00pm on CNN/U.S. It will air on CNN International at 7:00am and 3:00pm. All times Eastern. To give global viewers greater perspective into the opportunities and obstacles faced by the one-sixth of humanity that is India, Zakaria spoke with leaders in business, politics, Bollywood, and more. For insights on India’s multicultural, multi-class, multilingual, multi-religious society, Zakaria spoke with: the Deputy Chairman of India’s Planning Commission Montek Singh Ahluwalia; chairman and managing director of Reliance Industries Limited Mukesh Ambani, the wealthiest man in India; actress and human rights activist Shabana Azmi; former CEO for Procter & Gamble in India Gurcharan Das; politician and anti-corruption activist, Arvind Kerjriwal; actor and talk show host Aamir Khan; tech entrepreneur Nandan Nilekani; Member of Parliament from the Indian state of Odisha, Jay Panda; and chairman emeritus of India’s largest conglomerate, the Tata Group, Ratan Tata. While much of the world has experienced sluggish economic times in recent years, Zakaria reports India’s average economic growth (GDP) over the last decade has been robust – around seven percent. And, Zakaria points out, in 2014, India will exercise the “largest democratic process in human history” as hundreds of millions of Indians, using 800,000 voting booths and 1.3 million voting machines, will engage in the world’s largest democratic action by voting in the national elections. Yet, in addition to having democracy in common with America, India’s governance is also experiencing a crisis of political dysfunction – and on a grand scale. Widespread corruption threatens some of its economic opportunity, and India’s social caste system and endemic disparities faced by women threaten to incite a home-grown Indian version of an ‘Arab Spring’. More information about why India – and the success of India – is essential for the world may be found at www.cnn.com/gps. During the special broadcast, producers of the special will engage with viewers using the hashtag “#CrossroadsIndia” via Twitter. CNN Worldwide is a portfolio of two dozen news and information services across cable, satellite, radio, wireless devices and the Internet in more than 200 countries and territories worldwide. Domestically, CNN reaches more individuals on television, the web and mobile devices than any other cable TV news organization in the United States; internationally, CNN is the most widely distributed news channel reaching more than 271 million households abroad; and CNN Digital is a top network for online news, mobile news and social media. Additionally, CNN Newsource is the world’s most extensively utilized news service partnering with hundreds of local and international news organizations around the world. CNN is division of Turner Broadcasting System, Inc., a Time Warner Company.